Not Just For A Special Occasion! 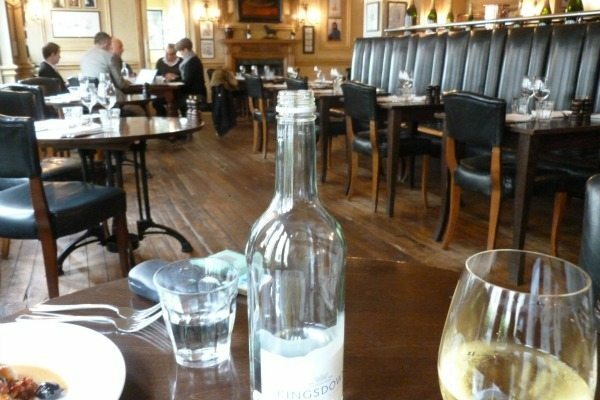 The last time I had lunch in Hotel du Vin it was graduation day and full to bursting with excited students clutching evidence of their academic achievements and proud parents ordering champagne to celebrate. It is the kind of place you might come to celebrate, whether it’s a degree or just a good day – you know you’re in for a treat. 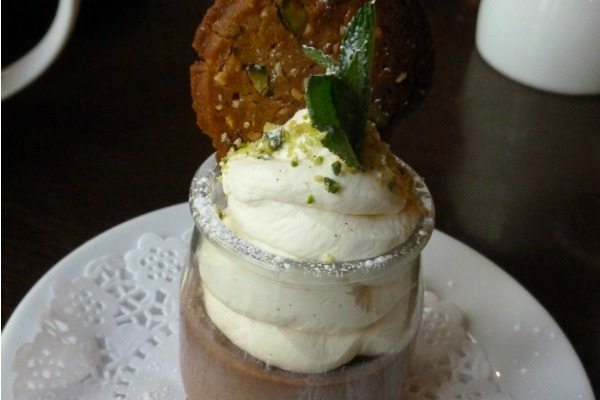 Good food, fine wine and excellent service in relaxed surroundings come at standard in this hotel and bistro chain and Brighton’s Hotel du Vin is no exception. My dining companion and I are not celebrating anything other than the end of January, which is reason enough and makes for a quieter restaurant but one which still attracts more than its fair share of diners for a weekday lunchtime. 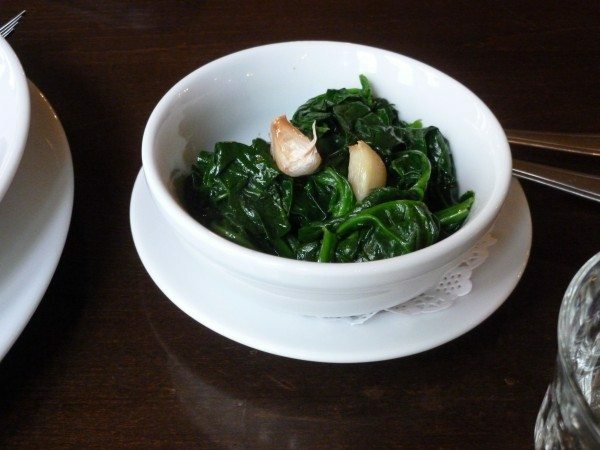 The Gallic style restaurants offer deceptively simply bistro style dishes, many of them slow cooked and all of them using fresh and local, where possible, ingredients. The menus change daily and, alongside some great lunchtime two or three course options, they offer bistro classics such as steak au poivre and smoked haddock fishcakes and an extensive A La Carte menu. 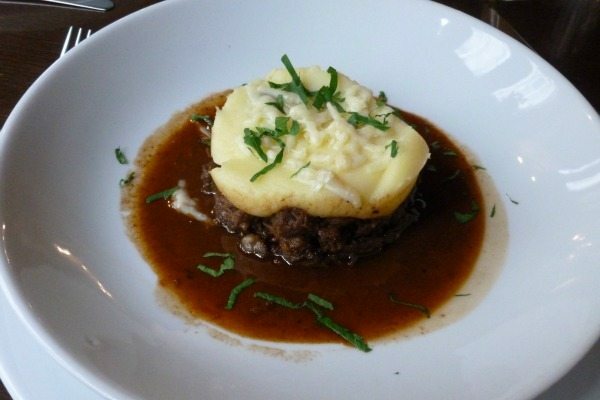 Sat raters include moules marinière, chicken liver parfait on sourdough toast with raisin chutney and a goats cheese quiche, while mains include beef bourguignon, cassoulet. and pan seared kidneys. 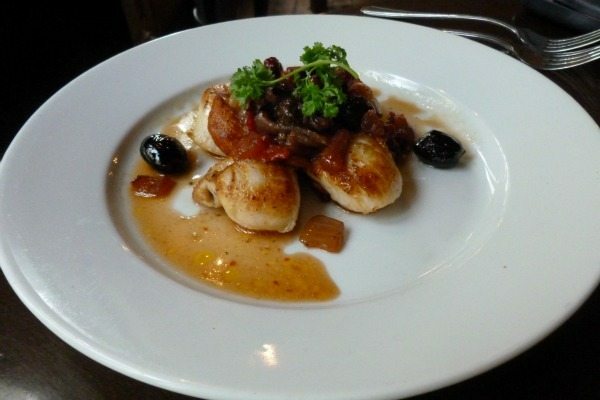 For starters my companion orders Shetland Scallops from the A La Carte menu, which arrive plump, and served with a generous dollop of piquant vierge (tomatoes, onions, capers and olives) while I choose Warm Roasted Pear from the fixed price menu. 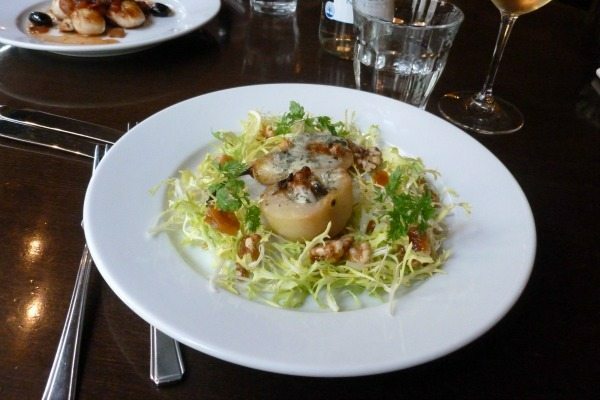 Cooked with Roquefort cheese on a bed of frisse leaves, with sweet caramelized walnuts, the firmness of the pear was perfectly complimented by the sweet crunch of the walnuts and the rich creamy cheese. The restaurant here is airy and expansive. In summer French windows open out onto the pavement and a glimpse of the sea, a stone’s thrown away. Inside it’s all creamy walls, hung with paintings, leather chairs, dark woods, soft lighting and the inevitable nod to the French national drink; paintings of wine bottles, vine covered pergolas outside and champagne bottles which ascend from regular to magnum ranged along dividing stands which give the large space a more intimate feel. Service is swift, efficient and unobtrusive. 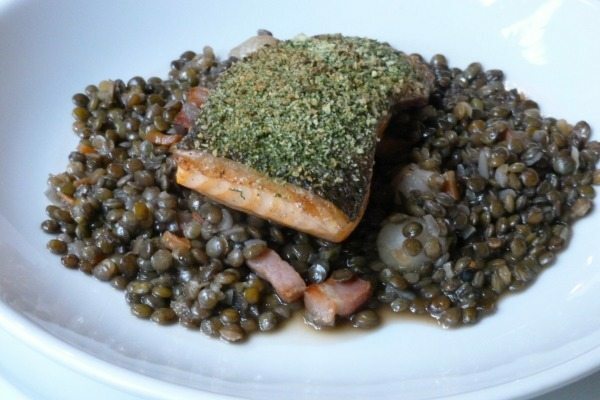 For my main course I’ve ordered the Hachis Parmentier, a melt in the mouth, robust flavoured beef and port ragout topped with mash and gruyere, while my companion has firm forkfuls of roast salmon on a bed of puy lentils and pancetta. The Du Vin chain specializes in reclaiming old city centre buildings and giving them a new boutique hotel and bistro lease of life. Appropriately this one was first built by a wine merchant in 1695. The impressive wine list, which includes a range of Sussex wines, is backed up by a well-stocked cellar and there’s a sommelier on hand if you want someone to do the wine choosing for you. Plus an array of craft beers and spirits served in the restaurant and adjoining bar and pub. 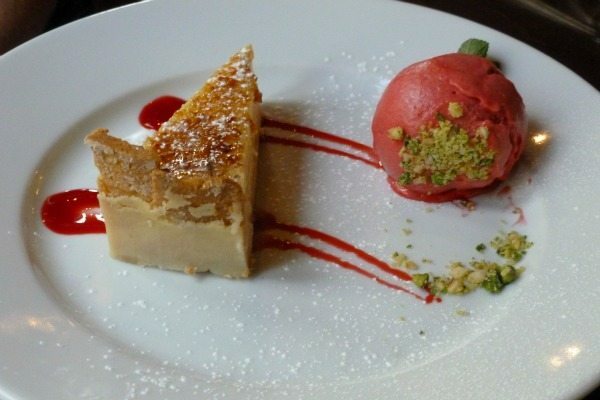 For desert we order a tangy tarte au citron with a raspberry coulis and a deliciously indulgent dark chocolate pot with a satisfyingly chunky praline brandy snap. If we were French we’d have slipped a sneaky cigarette in between courses but neither of us smoke, Still, it’s good to know that fondness for tobacco is indulged and those that do can choose a cigar form the humidor and sneak out for a smoke in the central courtyard. We round off our meal with tea and coffee and a moment of sitting and feeling contented. Lunch was not for any particular occasion, but the quality of food, the attention to detail and the surrounds all made it feel like one.